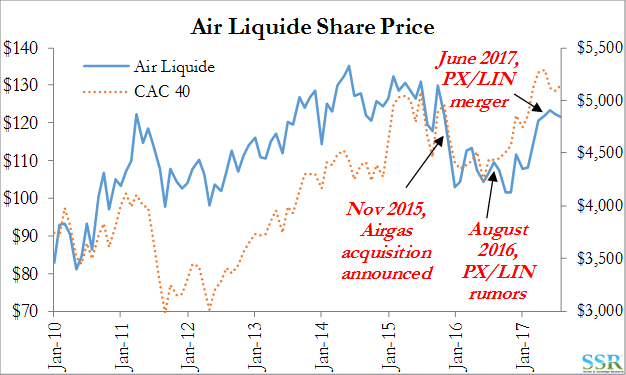 Air Liquide faces the same challenges as Air Products from the possible Linde/Praxair merger but has a couple of distinct advantages over Air Products that are noteworthy. 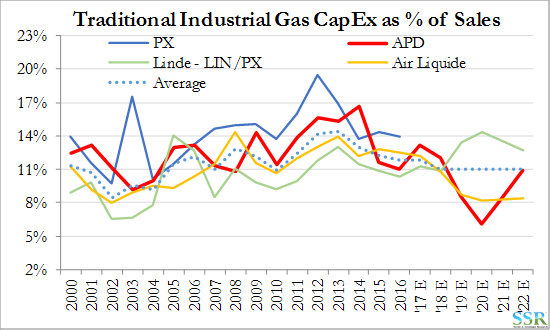 The company has a capital spend based growth story in the US, building air separation facilities in select locations to supply its own (Airgas) demand – it should not be as severely impacted by the likely LIN/PX dominance of the new capital side of the business. The cost base at AL appears high and if the company goes after costs more aggressively we show that it can beat consensus estimates for the next three years – even with reduced capital spending. It is cheap(er) than the rest – AL trades at 16x 2020 consensus earnings while APD trades at 18x – consensus EPS growth for AL is higher than for APD. We think consensus is too high for APD and (if there is a cost focus) too low for AL. The upside in the stock is not as significant in our analysis as it is for PX or LIN, but it could still be as much as 25% undervalued. The analysis behind these conclusions is based on the work that we have done on the sector in general – highlighted in research published on both LIN/PX and APD this week. 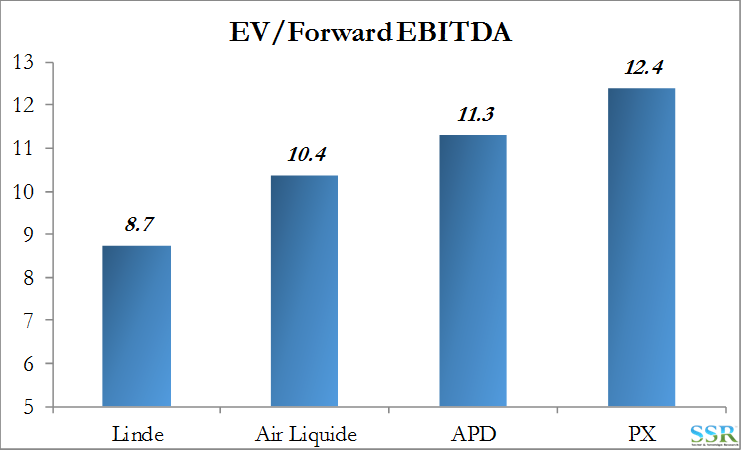 We have built an approximate industry model (for the big 4) and earnings models for the merged LIN/PX and APD and AL, with consistent assumptions around revenue growth, capex and market share. The model assumes that the new LIN/PX is created at the end of 2018 and that the assets required to be sold are not acquired by either AL or APD. The model also assumed that LIN/PX takes “new capital” share from AL but especially from APD – see research referenced above. 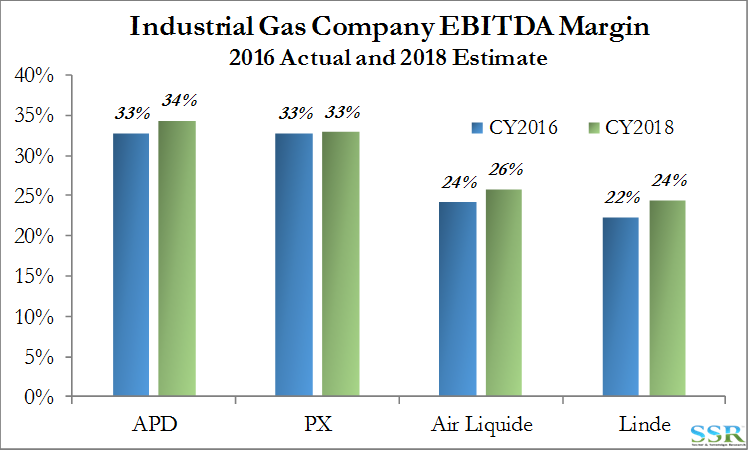 AL has a significant opportunity in the US on both the investment and the cost side as a consequence of the Airgas deal – if the company attacks costs aggressively we see earnings well above consensus – Exhibit 1. Our analysis suggests that the company should have cost opportunities outside the US also. Provide capital growth opportunities in the US – building air separation capacity to supply the Airgas operations in select locations – likely to the detriment of both PX and APD. Cost reduction, above and beyond the stated deal synergies. We expect AL to be impacted by the strength of LIN/PX and to lose “new project” market share, like everyone else, but not nearly to the extent that we expect for APD – the capex/sales data that we showed in the recent APD piece is shown in Exhibit 3. 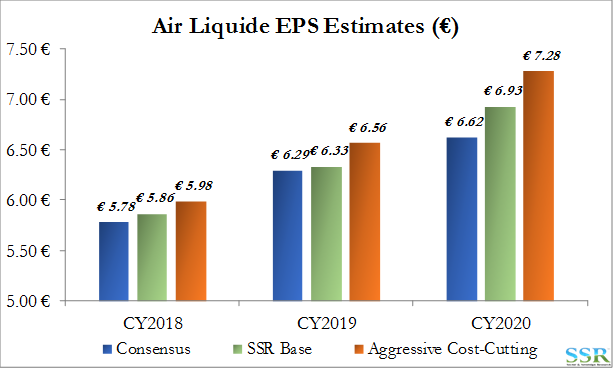 We have Air Liquide spending roughly $2 billion a year on a combination of maintenance and new projects – still enough to drive top line growth, and probably an appropriate strategy for AL given the need to repay the debt taken on with the Airgas deal. We have net debt falling from almost $16 billion in 2017 to roughly half that level by 2022. We do not show any buyback for AL in our model over that time, but net interest costs fall by 50%. The larger opportunity for AL, in our view is elective, as it focuses on costs. Given the size of the company and its recent US acquisition we see an opportunity for the company to boost earnings through a much greater focus on costs and margins. AL is not as cost heavy as Linde, but should be able to take as much as $1bn out of costs in addition to the Airgas synergies. We show some improvements in our base case earnings, which is largely why we are above consensus in Exhibit 1, but the upside scenario is driven by a greater focus on costs. From a strategic perspective, AL management should take the view that, while the Airgas acquisition provides opportunity, the nature of the underlying business has not changed – growth is slow, at best, and costs need to reflect that. If AL could raise its EBITDA margin to the current PX levels – Exhibit 4 – (not an unreasonable target given business mix), the company would save around $1.4-1.5 billion before tax. This would drive an EPS increase of over $2.5 per share on a 2017 basis – €2.20 per share – a 40% increase over current consensus! We would expect such gains to take time and while this is an unreasonable 1 year target, it is a reasonable stretch goal on a five-year time frame. We have not assumed this level of cost reduction in our high case 2022 estimate – we have roughly half this number ($750m) in that analysis. SG&A is most of the issue – Exhibit 5. The other reason to be interested in AL is its valuation. Setting cost opportunities aside for a moment, AL trades at a 2x EPS multiple discount to APD looking at consensus 2020 estimates – this is despite consensus estimates that have AL earnings growing more quickly than APD’s. Our analysis suggests that consensus is too bullish for APD – see recent work – and too conservative for APD. We see as much as 25% upside in the stock near term assuming that the company starts delivering on both the investment and cost opportunities – thereby surprising on the upside. As the company pays down debt (we have net debt moving from $15.5Bn in 2017 to $7.5bn in 2022), the debt should convert to equity – this should alone add 20% to the equity value. We see upside to the EBITDA number at a much higher growth rate than consensus.